Members and guests gather in the Officer's Mess at Vancouver's Bessborough Armoury, home of the 15 Field Regiment RCA (or Royal Canadian Artillery), at least four times each year. 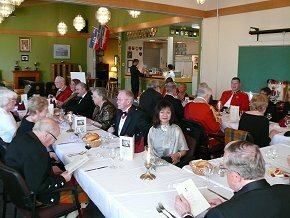 Mess Dinners may commemorate important actions of the Regiment, or traditional Scottish celebrations such as the Feast of St. Andrew and the Burns Supper. Regimental tradition and protocol are central to the ambience and demeanour of the garrison. 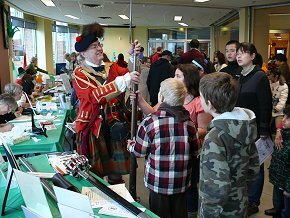 Some delight in the research and discovery of tales and exploits of the 78th during the Seven Year's War (as artifacts and documents at The David M. Stewart Museum at RHQ Montreal will attest), others enjoy the Highland elements and pleasure of a social evening in the Mess. Consider Membership with the 78th Fraser Highlanders! - Download our Membership Application! 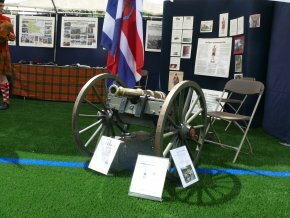 The charitable work of of The 78th Fraser Highlanders Association ("The F.H.A.") draws on the popularity and attraction of our Highland heritage, the Kilt and Red Coat and the hypnotic draw of The Pipes. The FHA presents fund-raising dinners and events to raise funds in support of the health, welfare and education of young persons in British Columbia. - The advancement of education by providing grants to persons or institutions. - Relieving sickness and disability of children in B.C. by funding hospices and caregivers. We welcome your generous tax receiptable donation! A tax receipt for generous donations over $20.00 will be issued. (c) 2019 78th Fraser Highlanders Fort Fraser Garrison, 1st Signal Corps.